Argentina is more than just Buenos Aires and its elegance that is revealed in its streets, its people, its shows, its lights, its nights, and its tango. The country has much to offer. For starters, it is Patagonia and glaciers. The southernmost spot in the world with its wonders. And, it is Ushuaia, Calafate, Bariloche, the Valdes Peninsula, or the Perito Moreno Glacier. A paradise of snow, glaciers, rivers, mountains, and lakes. It is the wine route in the Mendoza Region, framed by snow-capped mountains and filled with a seemingly endless number of vineyards. It is tropical, and a Wonder of the World: Iguazu Falls. It is a country of immigrants, historic revolutions, good food and drink, and, of course, afternoons of soccer. The land of the Gauchos awaits you. Small group experience | All travellers under age 18 must be accompanied by an adult. While it is our intention to adhere to the route described, there is a certain amount of flexibility built into the itinerary and on occasion it may be necessary, or desirable, to make alterations. On Day 1 of the tour you will be advised of any amendments. Below is an example of the hotel we may use in this city. For the actual hotel your specific departure will be using, please check your voucher. Upon arrival, you will be met at the airport by a representative to transfer you to your hotel. Today, visit the most important points of the spectacular city of Buenos Aires. Discover the history of May Square, the site of the most important historical events and their protagonists since its foundation: see its surroundings, the most emblematic buildings, and learn all about them. Then, enjoy May Avenue and wonder in awe at the oldest residential neighborhood in Buenos Aires, San Telmo. Walk along its cobble-stoned streets and discover its antique shops and picturesque buildings. Live and feel the original Tango in the neighborhood of La Boca: walk along Caminito Street and enjoy the dancers and souvenir shops. See the mythical Boca Juniors soccer stadium. Contemplate the modernization of the city whilst traveling along Madero Port and its exclusive docks, full of excellent restaurants and large offices. Pass through the Retiro neighborhood and move on to see Palermo and its most exclusive residential area before finally arriving at Recoleta. Once there, discover the final resting place of Eva Peron, “Evita“ and wander through Recoleta Cemetery where she is to be found. Following breakfast at your hotel, enjoy your morning at leisure. In the evening, head to La Ventana for dinner and a Tango show. At the heart of San Telmo neighborhood, La Ventana Barrio de Tango opened for business back in 1982. This totally refurbished historical “conventillo” (tenement) offers a definitive tour of classic porteño culture. This typical early 20th-century house is an ideal stage for a unique show: 32 artists, two tango orchestras, a folk music group, dancers, and singers. Breakfast at your hotel. You will head to a typical “estancia“ of the Argentine wet pampas, one of the most fertile natural prairies of the world and famous for its meat and cereal production. Enjoy the flavor of our “pampas“ at a touristy ranch located 110 km away from downtown Buenos Aires. You will be welcomed with meat pies (“empanadas“), a glass of wine or juices by the owners and served an Argentine B.B.Q. After lunch, a folkloric Gaucho’s show will be performed and you will have the possibility of appreciating the typical “Ring Race“ (Carrera de Sortijas) or ride on horseback. Kindly note that drop-off is not back to hotels but in different stops as follows: Puente de la Mujer (Puerto Madero), Galerías Pacifico Shopping, Av. Santa Fe y 9 de Julio, Juncal y Cerrito, Obelisco, Colon Theatre, or Irigoyen and Lima. Breakfast at your hotel. Enjoy your day at leisure or book an optional day tour to Colonia, Uruguay. Enjoy your final breakfast in Buenos Aires. At the appropriate time, you will be transferred to the airport for your departing flight home. With an indoor swimming pool, a sauna room and luxurious décor, the Pestana offers rooms with free Internet access just an 8-block walk from Florida Street. Gym facilities and massage sessions are available. Pestana Buenos Aires greets guests with a spacious marble floor lobby decorated with elegant wall moldings. 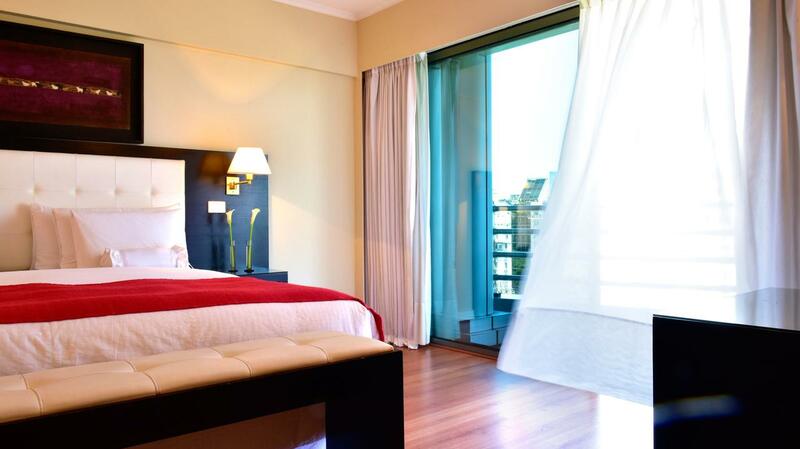 Air-conditioned rooms are styled with elegant dark wood furniture and carpeted floors. Some rooms have hydromassage tubs, flat-screen cable TVs and views of 9 de Julio Avenue. There are white leather sofas, upholstered chairs and private balconies. An American breakfast with regional jams and croissants is served daily at Tango Bar. Local specialties and international cuisine can be enjoyed at Il Moro Restaurant, featuring an impressive sculpted wood arch and decorated ceiling panels. Prices are per person and based on double occupancy. All prices are expressed in US dollars. Prices for vacation packages are subject to change without notice. All travel documents are the responsibility of the passenger.